A diver encountering a Porcupine while on dry land might run in the opposite direction. But for Key West Snorkeling participants, encountering a porcupinefish doesn't pose any danger of getting stuck. This variety of pufferfish, sometimes referred to as balloon fish or globefish, tend to very docile as they move through the warm tropical sea waters. They are easily recognized by the hundreds of small black dots that cover both their bodies and fins as well as their huge eyes and very wide mouths. But their gentle demeanor doesn't mean that Porcupinefish tolerate bad behavior. Whenever these fish feel threatened, they can quickly inflate their bodies by puffing them up with water to intimidate any predator. This sudden change in appearance is usually enough to scare off any predators and can surprise divers observing the underwater action as well. 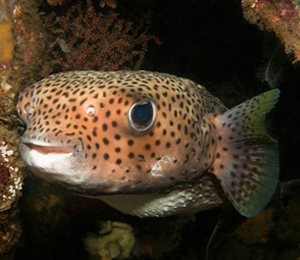 In full puffer mode, Porcupinefish can transform themselves into a shape that is difficult for other fish to eat. This puffing motion also extends the otherwise dormant spikes which protrude completely around the fish's body whenever they feel a need to puff out to their full size. Divers in Key West Snorkeling excursions are cautioned not to poke at or harass Porcupinefish simply to see their puffed out display. Porcupinefish are among the most gentle of sea creatures that divers can enjoy while snorkeling and these fish inflate their bodies as a protective action and not for the amusement of snorkelers.